A superb multi tap-delay effect with 16 independent, high-quality delay lines. What really sets Tekturon apart from other, similar products, is the way it’s controlled and the unique topology into which the taps are arranged: The Delay Matrix. In fact, Tekuron can't be thought of as a tap-delay effect in the strictest sense, but more of a sequence of taps equally delayed from each other, whereby working with the plugin strongly resembles using a step sequencer. This rather unusual design should give your creativity just the kick it needs! Despite the imposed, fixed topology, each of the 16 delay lines has its own independent set of parameters providing complete control over: Delay loop, Panning, Stereo spread, Post-tap multi-mode filter. Despite its superficially simple appearance, in the right hands Tekturon can be a very powerful production tool, indeed! You’ll certainly appreciate these for live performance situations, among others: conveniently placed, always accessible, and MIDI-assignable mute buttons for selectively suppressing individual delay lines. Invigorate your arrangements, bring some life to your production, and have fun! 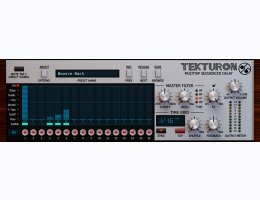 Tekturon provides the ability to control some aspects of the processing globally (adjusting parameters of all 16 delay lines at once) or locally (individually per delay line), thus making it possible to exert both fine-grained and convenient, 'one-knob' control over your performance! Click on the 'Demo' button on the Tekturon product page and Download a demo version of D16's Tekturon.